I just finished reading a post in the Higher Education blog about Historically Black Colleges and Universities and I’m fighting mad. the six-year graduation rates of 83 four-year HBCUs last year, finding that just 37 percent of black students attained degrees within six years. More striking than the low completion rate was the fact that the national college graduation rate for black students is actually 4 percentage points higher than that of HBCUs collectively, calling into question the long-held notion that HBCUs are better at graduating African Americans. Asked about graduation rates Thursday, Education Sector panelists suggested that funding levels could not be discounted as a significant drag on student success at HBCUs. “A lot of that [graduation] rate …. is grounded in money, lack of money,” Wilson said. Some HBCU officials say they still encounter hundreds of academically eligible students each year who drop out of college because their financial need cannot be met with Pell Grants and other aid. The vast majority of HBCUs have small endowments, so there isn’t a pot of money to dip into when financial challenges arise. – Make sure that parents have access to more information about saving for college early and regularly. – Reach students to plan for college costs earlier. – Help students of color save and aggressively seek scholarships and grants. – Assist families of color in better understanding college costs and finding the school with the best fit for them. 2) Students that graduated from HBCUs aren’t supporting the colleges and universities financially as much as they could. I wonder if there is an opportunity to assist HBCU students, and potential graduates, in becoming more successful and understanding how their contributing to their alma maters contributes to building a strong community. I think we all know the reasons we want more youth to have access to higher education. More young people in college means fewer young people getting into trouble with the law or getting stuck in low wage jobs. If we want our communities to be strong then we have to do what it takes to support others that are striving for positivity. 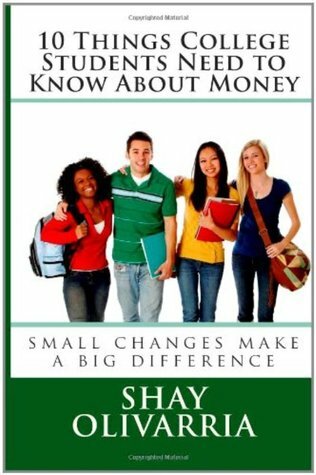 In an effort to reach more HBCU students I’m making an effort to share my new book 10 Things College Students Need to Know About Money with all 105 HBCUs in the United States. To kick things off I’ll be visiting Fayetville, Atlanta, Birmingham, Jackson, and Dallas-Ft. Worth this August. Want Shay to visit your school? Call Shay! One of the most often asked questions about personal finance is how to establish credit. There are several strategies that people use. One of my favorite tips is to get a cell phone. It’s a manageable monthly bill that will allow you to have a needed service while building credit. This article from The Smarter Wallet suggests a few other ways to establish credit. How many of us have seen those makeover shows on cable and wished we could have a financial makeover? Well, here’s your chance! This article on making over your financial life is a great place to start. It covers some simple, but important, tips to help you take control of your financial life. As we all know, the new CARD Act has a restriction that will prohibit people younger than 21 from applying for a credit card unless they have a co-signer that is older than 21 years old. That means that parents with students that will be heading off to college soon may want to co-sign for a card for their child to use in emergency situations, but how do you know which card is a good fit for a college student? This guest post from Digerati Life discusses some of the pros and cons of credit card usage for college students and which credit cards may be the best option for your student. I’m so pleased to tell you that the makers of Default: The Student Loan Documentary have partnered with Bigger Than Your Block to include the trailer for Default in all copies of my second book, 10 Things Students Need to Know About Money. As you know, my work educating folks about how important personal finance is includes college costs as well. Right now paying for college is one of the biggest challenges many families have. Traditionally, taking out loans has been the way many college students have bridged the gap between costs and available funds. While loans are not bad in and of themselves, many students weren’t sure of what they were getting themselves into and found themselves with a mountain of debt. Default: The Student Loan Documentary will help families better understand loan products. I’m proud that this informational documentary trailer will be available with 10 Things College Students Need to Know About Money.